Perry Block - Nouveau Old, Formerly Cute: You're No Ronald Reagan! And how many times can you use the words "Ronald Reagan" in a sentence? Wolf Blitzer: Good Evening. This is the 75th --- excuse me, 76th --- debate between the candidates for the Republican nomination for President of the United States. I'm Wolf Blitzer of CNN, and with me is is Brooke Baldwin, also of CNN. Brooke Baldwin: Good Evening, Wolf. Good Evening, high cheekbones. Blitzer: Tonight there are only two candidates debating, former Governor Mitt Romney of Massachusetts and former Speaker of the House Newt Gingrich. Good evening, gentlemen. Mitt Romney: Hello, Wolf. G00d to see you, Brooke. Nice cheekbones. Newt Gingrich: Hi-ya, Brooke! I've...umm ... admired your cheekbones for years! Blitzer: Governor Romney, first question. As we all know, the revered patron saint of the Republican Party is former President Ronald Reagan. Blitzer: Now, Governor, the Speaker has asserted that although you purport to be a 100% devoted Ronald Reagan conservative, you're in truth a Massachusetts moderate. Your response? Romney: Wolf, that's plain ridiculous! I proudly espouse all the values, beliefs, and goals of Ronald Reagan's America! Ronald Reagan is and always has been my personal hero. That's why I am, in fact, the one true heir to Ronald Reagan! Blitzer: Speaker Gingrich, the Governor has asserted that you claim to be a Washington outsider even though you've been in Congress for almost 30 years. Gingrich: Wolf, that's plain ridiculous! I proudly espouse all the values, beliefs, and goals of Ronald Reagan's America! Ronald Reagan is and always has been my personal hero. That's why I am, in fact, the one true heir to Ronald Reagan! Baldwin: Well, you can both be the one true heir. Each of you please explain why you are. Gingrich: Brooke, Governor Romney wouldn't know Ronald Reagan if he fell over him on his way to a pro-abortion rally! I am the one true heir to Ronald Reagan, who incidentally is the greatest actor in the history of American cinema and especially brilliant in my favorite Ronald Reagan movie, Knute Rockne, All American, starring Ronald Reagan! Romney: Brooke, Speaker Gingrich wouldn't know Ronald Reagan if he fell over him while bending over to pick up an exorbitant check from Freddie Mac! 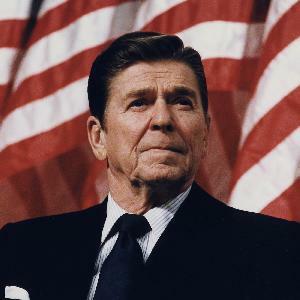 I am the one true heir to Ronald Reagan, who incidentally is the greatest actor in the history of American cinema and especially brilliant in my favorite Ronald Reagan movie, Bedtime for Bonzo, starring Ronald Reagan! Baldwin: Speaker Gingrich, how can you demonstrate that you are the most like Ronald Reagan? Newt Gingrich: Brooke, if it's always been your desire to sleep with Ronald Reagan, remember that as a 100% devoted Ronald Reagan conservative, I am the next best thing to Ronald Reagan! Ready? 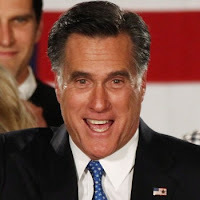 Romney: Brooke, if it's always been your desire to sleep with Ronald Reagan, remember that as a 100% devoted Ronald Reagan conservative, I am the next best thing to Ronald Reagan! So, now? Blitzer: Gentleman, Brooke and her cheekbones will give those generous offers due consideration. One more question: Each of you is kind of goofy looking --- you, Governor Romney, with your excessively greased and dyed hair and you, Speaker Gingrich, with all that hanging flab directly under your neck. Looking like you guys do, why should either one of you be President? Romney: Wolf, yes, I regularly grease and dye my hair. Just like Ronald Reagan! Gingrich: Wolf, yes, I do have huge pendulous gobs of unsightly hanging flab under my neck. Just like Ronald Reagan! Romney: You're no Ronald Reagan, sir! 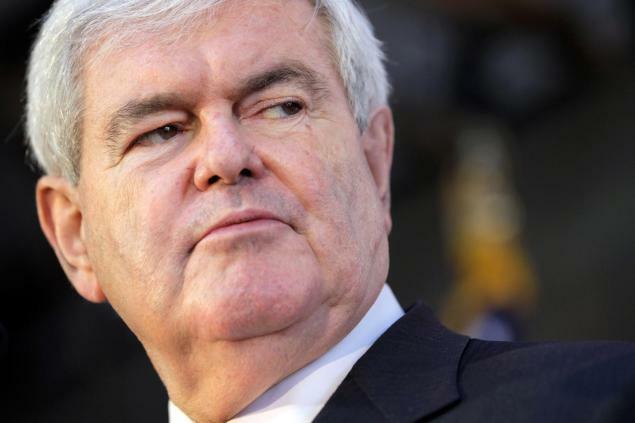 Gingrich: And you're no Ronald Reagan, sir! Neither one of you is Ronald Reagan! And BTW, they have no jelly beans up here. Either of you two Ronald Reagan geniuses got any? Love me, love my gobs!